Family History or Time Travel? When I was younger, and getting to know people (generally boys or girls I was attracted to and wanted to woo), I would give them a list of 20 questions and ask them to answer them all. It would either be done in person, on the phone, via a letter or more recently, via email/chat. These questions would be all about getting to know the other person better, find commonality and hopefully present myself as somewhat mysterious, enigmatic and far more intellectual than I am. Which time period would you most like to live in and why? My answer to that question would often depend on their answer (because, remember, I was trying to get them to fancy me, so I had to be as similar to them as possible. Yay, psychology!) and I’d say anything from “Ancient Egypt” to “200 years in the future”. I wasn’t really thinking about it. Sure, I was interested, but my answer was generally not genuine. Being a genealogist, I get to look into the lives of so many different people, from different backgrounds, places and times. Whilst most of the research I do is in the British Isles, one county to the next can provide completely different customs, events and names. Add time to this and these lands present an immeasurable amount of genealogical and historical variety. Looking at the rest of my family and where they’re from, we need to add Australia, New Zealand, South Africa, Sweden, Norway, Germany and Eastern Europe into the mix. To pose that question to myself today means I need to really sit back and think. Sure, I could answer something glib like “Oooh, the roaring twenties” or “the middle ages” – but what does that really mean? When we think of those two eras, in particular, we probably think of Flappers and Knights/Damsels, respectively. But we know that to think of an era in such a simplistic manner is to completely gloss over what was really going on then and what life would be like were I to time travel and spend the rest of my days there. Would I be able to ignore my modern way of thinking and take on board the beliefs and desires of people in the 19th century? Would I want to live in Shetland in the 1800s, when my ancestor, Robert Scollay, was forced to leave and travel to New Zealand due to poor economic opportunity, land clearances, and agricultural failures? What would it be like experiencing poverty, uncertainty and fear? Would I want to get on a ship to travel to the other side of the world – not knowing what I would encounter, and knowing I would never see my family again? Would I be a strong pioneer in New Zealand? Would I be able to build a life from nothing. Find land, build a home, scrounge together a living from whatever I could do or find? Would I want to do the same with my ancestors in Australia? Could I force first peoples from their land in order to build colonies of New South Wales, Victoria or Van Diemen’s Land? Would I keep my head down and ignore what was going on around me? Would I be able to ignore my modern way of thinking and take on board the beliefs and desires of people in the 19th century? Or perhaps I’d like to travel to Sweden in the 16th century? Live and learn about life and the seasons with my family in Västra Götaland and Skåne. Spend my days on the farm with the cows and sheep and work from dawn to dusk helping to maintain the household? I could go to another time, the 13th century, back to Scotland, and the Bruce clan, with my ancestor Matilda and her brother, Robert, who would become known as Robert the Bruce. What would my life be like as the daughter of a Baron and Countess? Living in a land in turmoil, with in-fighting and threats from England? Knowing that my position and life could be used to determine the course of political and personal life for so many in the land? These are questions I now often ask myself when I am doing research (for myself or clients) and it is why I find it so terribly important to put as much context into my research as possible. Looking at my tree while I write this article, I see so many names, so many dates with lifespans, marriages, and other events. They are all part of who I am and have created a legacy that will last, but who were they? Really? Family history is time travel. We don’t need a magic spell or a set of standing stones to be able to go back through the years and discover what life was like. We can find so much information from our ancestors and incredible research done by so many genealogists and historians. Adding to this body of research is so important and will be invaluable to future generations. I am proud to be a part of it, and vow to do more. From this point, when I go over previous research or do further research into my ancestors, I will not move on to another generation until I have exhausted all possible avenues and repositories of information for the people in the current generation being researched. I want to create the story of how my family became to be and that starts with the families that went before. I will be reproducing some of that research here, and in the coming months will be publishing papers on my ancestors from Shetland, along with information about the people over the years who lived in one house in Sussex. Author Erin TilleyPosted on 20 February, 2019 20 February, 2019 Categories ancestry, Australia, Britain, genealogy, Great Britain, Ireland, new zealand, research, Sweden, UncategorizedTags ancestors, ancestry, australia, family tree, genealogy, history, new zealand, research, scotland, swedenLeave a comment on Family History or Time Travel? Some months ago I posted about the mystery in my family of my grandfather who discovered he was adopted when he was in his 60s. As a genealogist, I had been researching his birth family to no avail for a number of years. I finally had a breakthrough last year when I found evidence of his (alleged) birth father’s subsequent marriage, children and so on. After being in touch with my (alleged) great-grandfather’s descendant, Paul, for some time, he finally did an Ancestry DNA test and we’ve been waiting for the results to come through. It’s been quite a nervous wait – what if I was wrong? I was in a business meeting the other day and got onto the topic of DNA testing and genealogy with the client. I decided to show them my research and also my DNA test results (I am always happy to talk about genealogy, especially if there’s a chance I can give someone else the bug). Logging into Ancestry DNA I saw there was a new match and that this match was listed as being a potential 2nd or 3rd cousin. Looking more closely, I realised I recognised the username as being the same as Paul’s email address. I gasped and said “Oh my god”. The client was worried and asked if I was alright and I then went on to explain the story and that this result showed that my research was right. I had found the descendant of my grandfather’s birth father. 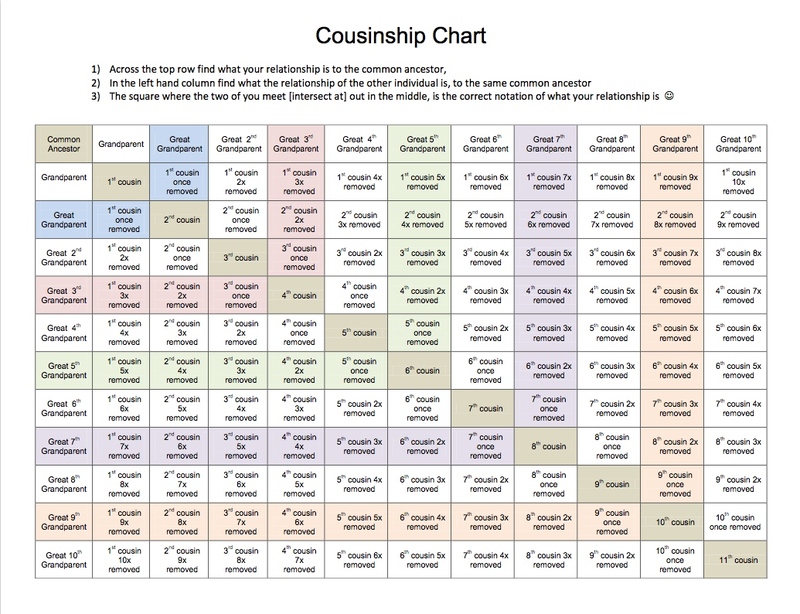 The following table gives an explanation of how the cousin relationships work. 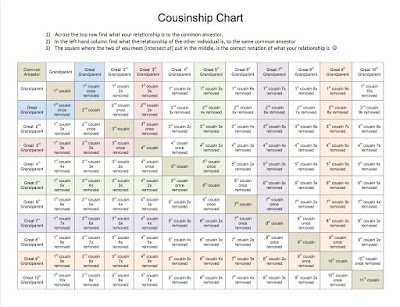 It’s complicated at first but looking at it Paul my mother’s 1st cousin (half) and my 1st cousin once removed (half). This is because mum and Paul share a grandfather (Allan Douglas). (The half is important here. My grandfather’s birth mother was not the same woman as the woman his father married, so subsequent children had a different mother). This journey and the discoveries made (and the doors now open – so much research to be done on the Williamson side now) are why I love genealogy and why I spend so much time on it (both academically and personally). Not only for the whole Nancy Drew/Scooby Doo mystery solving aspect of it (although that is freaking cool), but because I have the opportunity to bring people together. Being able to do this for my mum has been a real blessing. She is an only child so finding a whole new set of relatives is important for her and I am glad I have been able to give her that gift. One hundred years and ten days ago, my great, great uncle Olaf Milford Johanson enlisted for service abroad with the Australian Imperial Force. He enlisted at Claremont in the state of Tasmania, which is 26km from the town of Cambridge, where he lived. Both towns are now suburbs of Hobart, the capital of Tasmania. 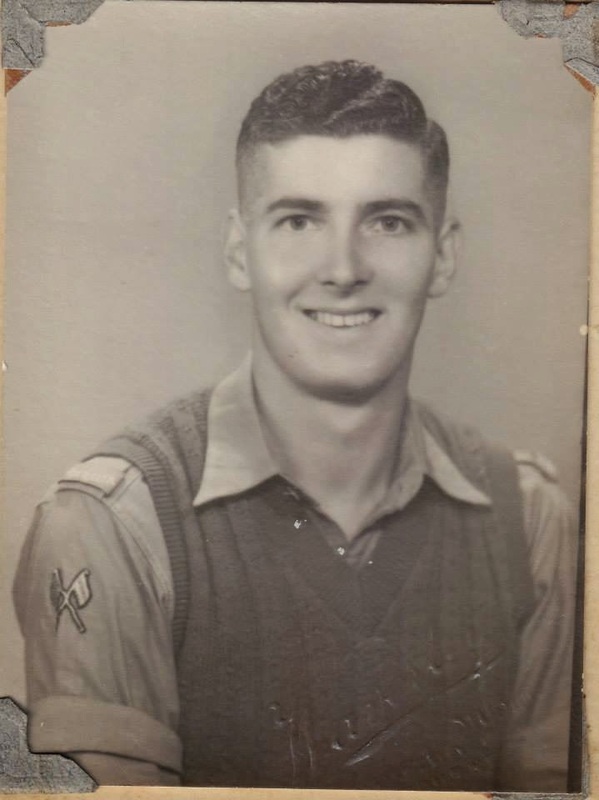 He was 21 (and 1/2, by his own hand) on the date of enlistment and, thanks to the records I have, I know he was 5’9″/1m75cm tall, weighed 193lbs/86kgs and had brown hair and light brown eyes (like me!). Under “Distinctive Marks”, the following is written: “Tattoo Heart cross and anchor on right forearm. Anchor & ribbon on front of left forearm. Anchor on back of left wrist.” It comes as no surprise that next to “Profession or Calling” he has written “Sailor”. Olaf was assigned the service number 3483 and initially served in the 11th Reinforcements of the 12th Batallion. (The 12th Batallion were originally raised within weeks of war being declared and were the first ashore at Gallipoli on April 25, 1915). I have Olaf’s entire personnel records and, as the months go by plan on blogging about his movements and the movements of his batallion(s). This is the first part in a multi-part blog series about DNA testing and genealogy. When I decided to try the Ancestry DNA test, I was a bit put off by the fact that I’d need to gob into a test tube. Someone as classy and sophisticated as me simply does not spit, regardless of the scientific results. But for the sake of science, history, genealogy and my own bloody curiosity I built a bridge and got over this particular wave of discomfort. (This is proof that I am actually on my way to becoming a true professional). To be quite honest, when the test arrived I was soon quite happily gobbing away into the plastic tube. The influence of Apple of product packaging and presentation has been clear for a number of years. Clean lines, lots of white. Minimalism is key. I was, however, surprised to see that this influence had extended into the realm of genealogical DNA testing. It’s quite simply a beautiful product. It’s a shame one has to mar it with saliva, but needs must. Even the website to register the test is squeaky clean. For my web design friends – is this a matter of clean design, or is it a matter of familiarity (from using Apple products) and therefore an increased sense of trust? Answers on a perfectly and ethically designed website, please. After spitting in the tube, adding the DNA stabilising solution and giving it all a good shake, I slipped it into a bio-hazard bag and into a lovely little postage-paid box that came with the kit. I then sealed it all up and popped it into the post-box. The lack of immediate gratification was a wee bit disappointing, and the wait until I got my results felt extremely long. The website provides tracking information from the moment you register the test. I checked the site every day to see if its status had changed from “Activated” to “Arrived” and more importantly “Processing”. After around a week, the status changed from “Activated” to “Processing” rather quickly. I was then into the longest wait-phase. 6-8 weeks while the testing is done. I waited impatiently for the test to confirm all my research and particularly looked forward to seeing if Britain, Ireland or Scandinavia came out on top. I expected it to kind of the way Eurovision does, with Scandinavia winning and Britain and Ireland getting a few points somewhere down the line. I also joked that I hoped something completely obscure would turn up my results and hit us from out of left field. “OMG I HOPE IT SHOWS I’M JEWISH” I thought, knowing my step-father (who is Jewish) would find it hilarious. I checked the website daily for an update and was growing more and more disappointed as no results were posted. “Maybe your DNA is so weird they’re having difficulty finding anything human in it,” commented one friend. I started to think he may be right. No results. No results. No results. With a sense of immense excitement (and trepidation, perhaps I *am* alien) I logged into the site to see just who I am. To say the results surprised me would be an understatement. I was incredibly surprised to see both Scandinavia and Great Britain so far down the list. I was also overjoyed to actually see European Jewish in the list (my step father merely rolled his eyes when I told him). Looking into the information on the data further, this is what is noted for the different regions in which my DNA has been. France seems to be the main connection point between all the regions except for Asia South meaning (in my 100% scientific opinion) my potentially French ancestors got around a bit. I’m reading as much as possible about DNA testing for genealogy and the impact it can have on research. I shall write a future blog post about how such testing can influence the research one does and the results of research that people not only find but really want to find. The prospect of phoning someone you are potentially related to and announcing that their grandfather had an illegitimate child is, to say the least, rather daunting. I sat in my living room, phone in hand, papers strewn around me, rehearsing what I would say. “Hi, so uhmmm, I think we’re related”. No, no. That’s too blunt and too vague. “What do you know about your grandfather’s activities before he married your grandmother?” Ugh, too clinical and cold. “So did you know your grandfather went and got some girl knocked up?” Ugh, no, no no no no no. “I’m really not trying to ruffle feathers, but the evidence I have strongly points to your grandfather having been with a woman called Catherine Robertson before his marriage and, as a result, being the birth father of my grandfather”. Yes, that’s as good as it gets. 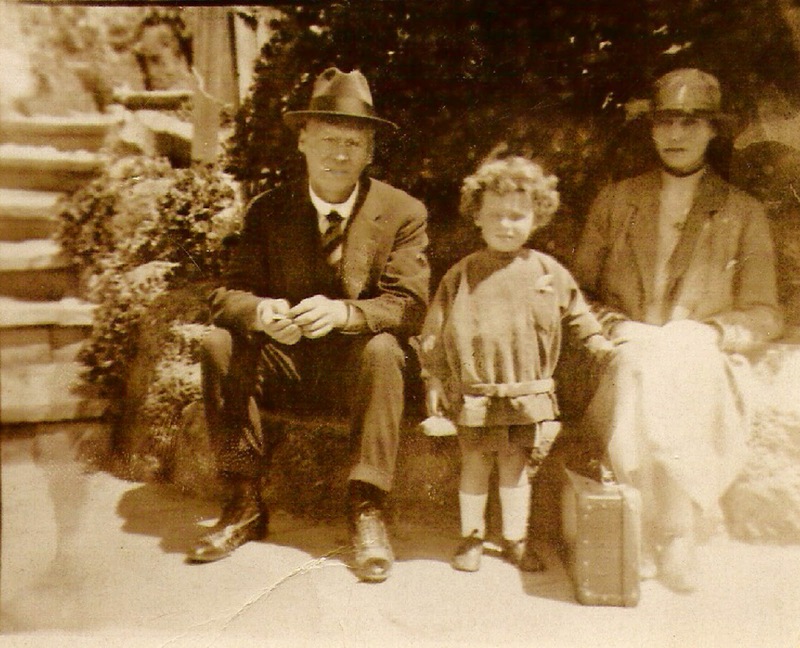 Geoffrey Hartley Crawford (R) with his (adoptive) parents Henry and Sophie Crawford, and his sister Dulcie. Time zones are really not my strong point. You’d think that after 18 years of living in France I’d have worked out how to correctly determine the time in Australia, but the number of times I’ve phoned my mother at ungodly hours is too many to count. I was to call New Zealand, and wanted to be sure I didn’t phone too early or too late. I checked, I double-checked, I tripled-checked the times and decided to call at around 10am NZ time. So, there I was sitting on the sofa, back straight, leg nervously shaking, silently panicking and practicing out loud what I was going to say. It wasn’t quite late enough in the day for me to have a wee nip for bravery, but I certainly felt like having one. I dialed the number and held my breath while it rang. I tried to keep my cool but I am absolutely certain that all came out in one breath and that I confused poor Paul at first. His reaction was exactly what I hoped it would be – interested, open and warm. We had a lovely chat, I told him about my grandfather and mother and sister, and he told me what he knew about his grandfather and his family. He said he would send me more information when his wife got home, so we exchanged email addresses, and promised to stay in contact. My grandfather, Geoffrey Hartley Crawford at home in Sandringham, Victoria, Australia. I hung up and promptly burst into tears. The relief at the positive reaction of Paul and the happiness and finally getting somewhere with this family secret and mystery that I’d been researching for over ten years was palpable. I spoke with my mother and told her the good news. She was amazed and rather overwhelmed. I then drafted and sent an email to Paul. My grandfather, Geoffrey Hartley Crawford found out he was adopted in the 80s when he applied for a passport. His birth name was Edgar Lance, but his adopted parents renamed him Geoffrey Hartley. 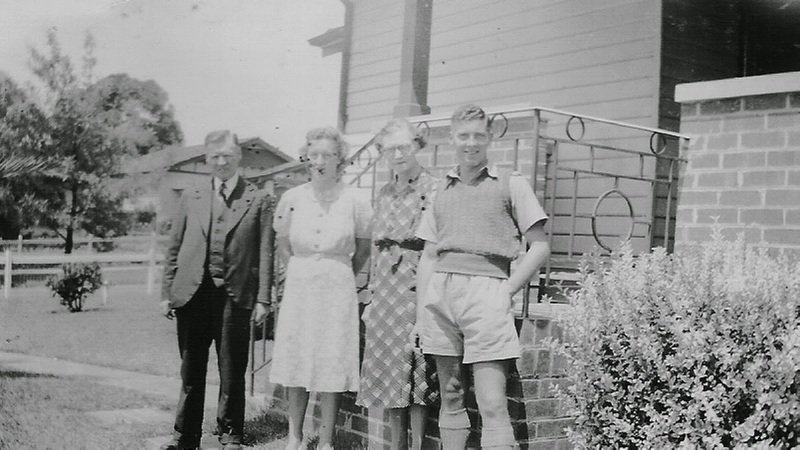 Mother’s name: Catherine Robertson, originally from Mornington, Dundein, New Zealand but went to Australia and gave birth to my grandfather in Melbourne. 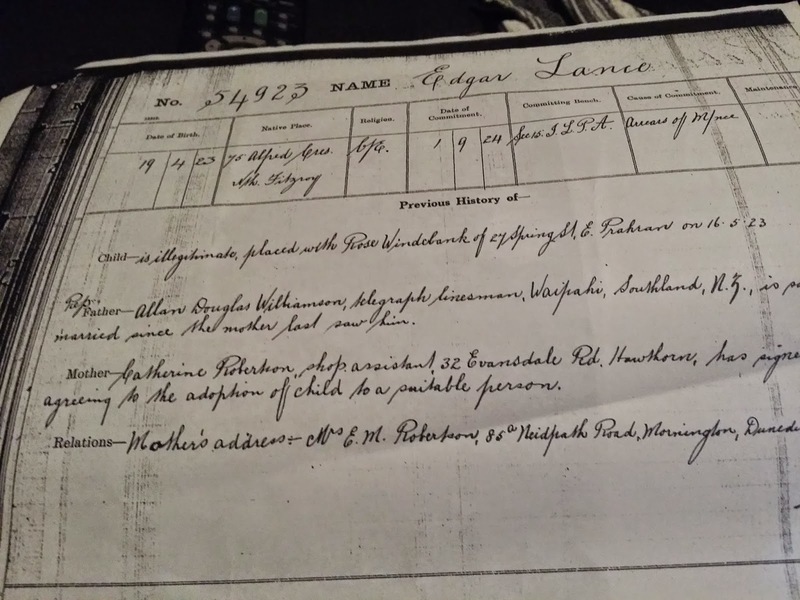 I’ve included a photograph of the birth certificate which gives this information. I’ve also included two photographs of my grandfather, one of my mother and one of myself. Do you see any family resemblance between us and your side of the family at all? Also, please feel free to send me any information you have about Allan’s parents or anything about the Williamsons. I would love to pick up the research and see what I can find out about our shared ancestors. Also, just so you know, we are first cousins once removed. I got an email back a few hours later from Paul’s wife Robyn, with so much information and a wonderfully moving welcome to the family. The biggest surprise, and final confirmation for my mum and I, were photos of Allan Douglas that showed a definitely family resemblance. Since then Paul, Robyn, mum and I have been exchanging emails, chat on Facebook and I even had a wonderful almost 2 hour-long Skype call with Paul and Robyn. The best part of all this for me was when my mum told me she finds it all quite emotional. She’s an only child (as is her mum) and her extended family was always quite small. She is so happy to finally have more family members. This is, of course, just the beginning of researching this branch of the family. There’s Allan Douglas’s efforts during WWI to look into, as well as the activities of his father, Captain George Williamson who was a merchant seaman. There’s the family links to the Shetland Islands which are coming up in my research, as well as the link to Robert the Bruce (yes, the Robert the Bruce). For some people, researching their family tree is all about how far back they can go and while that is, of course, interesting for me the most important thing is to learn as much about the people who form my family history and, as a result, form part of who I am today. I have a big family. If I count my parents, step-parents, half-brother and sister, my step-brothers and sister, their partners (and their children) plus my grandparents then we’re up to twenty-two people. Add cousins, uncles, second cousins and the like (and their children, partners, etc), and we’re inching close to one hundred people. Most of my large extended family is on my father’s side as my mother is an only child. Born in 1953 to Geoff and Anita Crawford, she didn’t encounter a large family until she married my father. I’ve not asked her how she dealt with that, but knowing my mum, she took it in her stride, rolling her eyes at all the quirks that come with large families. Her parents also came from small families. My grandmother, Anita, was also an only child and my grandfather, Geoff, had one sister. She has cousins, who I never knew as they lived in Queensland as we in Victoria, but all in all – small family was the way of the Crawfords. In the 1980s, my grandfather applied for a passport. The rules had changed in Australia, and he needed to provide a full birth certificate (not just an extract) in order for his passport application to be processed. This is when he found out that he was adopted. Geoffrey Hartley Crawford was actually born Edgar Lance Robertson/Williamson. His mother, a woman named Catherine Robertson was originally from New Zealand and came to Australia to live with an aunt and give birth. His birth father was a man named Allan Douglas Williamson, from Waipahi, New Zealand and, according to the birth certificate, had married another woman since Catherine had last seen him. I began the search for Allan and Catherine in the early 2000s, when genealogical records were just starting be digitised and readily accessible. Over the years I found evidence of Allan Douglas living in Gore, New Zealand (in the 1940s and 1950s, thanks to census records), but never found any evidence of his parentage. Of Catherine, there was no trace. I have been using Ancestry for a number of years, and would regularly run a check on both Catherine and Allan, hoping for some hints or results in the records search. In March of this year, I started getting results on Allan. His name was showing hints, his parents were showing up in the records, along with his wife and their sons. I reached out to all the people who either owned this information, contributed to the information or had the information on their trees. The goal was to get in touch with any living descendants of Allan Douglas. Geoffrey Hartley with his adoptive parents Henry Francis and Sophie Grace Crawford. After many responses denying knowing the family or even having the people I mentioned in their trees (really people, just have a look, they’re there), I received a reply from a woman who said that not only was she related, but she had spoken with one of Allan Douglas’ descendants. She gave me his name and phone number and told me that he wanted to speak with me. A much-loved go-to pseudo insult of Australians by the English is “convict” or, if they’re feeling particularly nasty, “crim”. I am here to declare once and for all – calling us “convict” is not insulting. In fact, we love it. No, really, we absolutely loooooooooove our collective convict heritage and, as a genealogist, there is nothing better than finding a convict in my family tree or the tree of someone for whom I am doing research. The BBC series Banished has rekindled an interest in the plight of convicts sent to Australia, a place which is often referred to in the series as a “godforsaken corner of the world”. This is just unfair. Sure, they landed at Botany Bay (original name Stingray Harbour, but changed out of respect to Steve Irwin) but it’s not the fault of Captain Arthur Phillip that he chose to land in what would become Sydney. Had he simply persevered further south, he would have been able to land in what would become Melbourne, and they all would have had a much nicer time. If Banished is to be believed, they actually had an alright time of it. Hanging out on the beach, getting married, enjoying good weather every day, being able to ignore the Paleo fad and living on a high-carb diet, hanging out with that bloke from Game of Thrones, and creating what would become one of the most amazing, friendly, inclusive and non-racist societies on the planet. Really clean and pretty convict people who are probably not 100% historically accurate representations of the convict population in the 1700s. Researching ones convict ancestry can be tricky. Not only because every second person was called John Smith or Mary Jones, but also because the accuracy of their convictions, sentencing and subsequent duration of transportation can be a bit hard to ascertain. Take the story of Patrick Glennon, one of my ancestors and the first convict feather in my genealogical cap (I have four, total, which actually makes the the equivalent of a Duke in convictdom). Patrick was a native of Clontarf, Dublin, Ireland when, in 1849 he was arrested, tried and convicted of the stealing of one bullock. His sentence – 10 years transportation to Australia. Another version has Patrick arrested, tried and convicted of the stealing of one bullock and one heifer (an enterprising young lad, Patrick understood that boy cow + girl cow = baby cows = money). His sentence was 7 years transportation to Australia. Yet another version has his sentence as life. Not so pretty convict people. 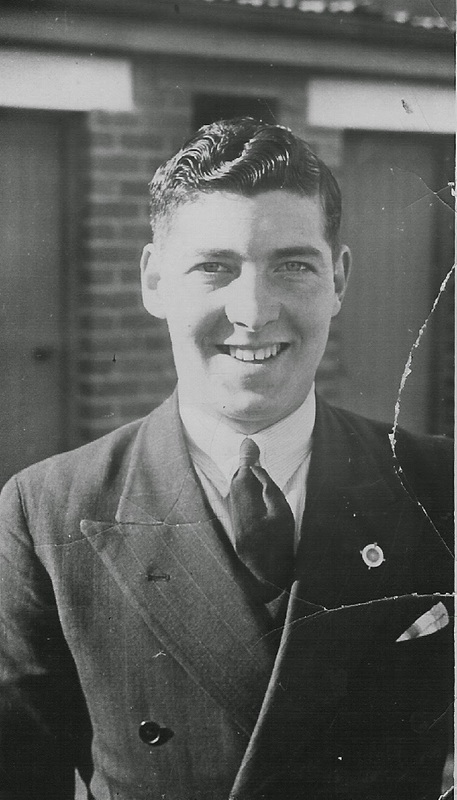 What we do know is that young Paddy travelled with just 8 other convicts on the transport ship the Hyderabad. They left Dublin on 23 May, 1849 and arrived in Van Diemen’s Land (Tasmania) on 26 August, 1849. Patrick is listed as being the only convict on the ship with a life sentence, the others having an average sentence of 7 years. Patrick was pardoned in 1854-55 and went on to marry, have lots of babies and start one of the branches that led to me. So, yeah I’m proud of him. Did he break the law? Probably. But what we need to keep in mind is the high levels of poverty in Ireland at the time. This was smack-bang in the middle of the Great Famine. People were hungry, people were desperate. I won’t go into a discussion about the merits of transportation vs imprisonment – so many what ifs there it will just make my head hurt. What I will say is this – men, women and children who broke the law (or broke the law) were transported to Australia. They were ripped from their homes, their families and friends, and taken to the other side of the world with no realistic chance of ever returning. They endured a horrendous journey, hard labour in a quite hostile land and, when they were released, often had to fend for themselves. Patrick Glennon’s pardon. I guess he finally learned how to behave himself. They formed the backbone of the country and embody the tough spirit of Australians. Aussies are tough, but we find humour in a lot of things. I believe this need for humour has been passed down the generations by the sheer necessity to see the positive in a situation in order to survive. Should we overlook the soap-opera feel of shows like Banished and take the history of convicts more seriously and should we more closely investigate the hardship and horrors endured by these people? The story of every single convict is an important part of Australian and British history and sweeping it aside as the go-to joke when talking with Aussies could be considered inconsiderate. But, in true Aussie nature our go-to reaction is to see the humour in it and brush such comments aside as funny. Because they are funny. While the well-behaved (or badly-behaved but imprisoned) British subjects didn’t have to endure a horrific journey to the other side of the world, never see their families again or do years of hard labour building a colony, they did have to continue enduring the British weather. So next time you’re calling an Aussie a convict, keep in mind that behind the smile and the laugh there swells an immense pride, a silent nod and a raising of a glass to the men and women who helped shape our country and our culture to be what it is today. Oh look another genealogy blog. What’s different about this one? For the moment, not much, it’s quite empty. Unlike my family tree. A couple of thousand people (including extended family) and counting. In October I will begin postgraduate studies with the University of Strathclyde in Genealogy, Palaeography and Heraldry. As I move from being an amateur genealogist to (hopefully) a professional genealogist, I would like to document my experience. While I feel I have a lot of experience in researching family history, as my studies progress I am certain that my methodology and understanding of documents and processes will change. Hopefully, it will make for interesting reading. So, why does a customer support manager with 15+ years professional experience decide to change career so extremely? When I was 14 years old, I snuck into my grandmother’s bedroom, rooted around under her bed, and withdrew an old tattered suitcase that contained a stack of papers and a magnifying glass. This suitcase held the entirety of her research into my grandfather’s family history. I recall looking through the barely legible photocopied pages in wonder, marvelling at the old handwriting, and trying to understand the Swedish in which they were written. I was, of course, caught by my grandmother and told not to go through other people’s belongings, but I was hooked. I asked her to show me how she found all the documents, how she read them and also asked her to teach me Swedish! From that moment I helped my grandmother with the research, and began learning about genealogy and how to trace my family history. Fast forward to 1998 and I am now living in France. I’m studying part time with the Open University for a BSc and I am still fascinated by genealogy. 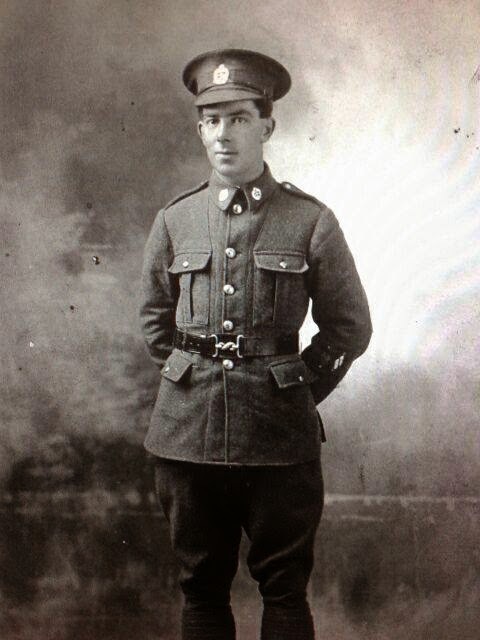 I knew my grandfather’s uncle had fought in WWI in France, and I decided to find out more. This was the early stages of online genealogical research, and through message boards, local historical research associations and the Imperial War Graves Commission, I was able to discover not only where my great, great uncle Olaf was buried, but also exactly which battle he was in when he died, and what likely happened between 1916 when he was reported MIA and 1930 when his body was discovered. 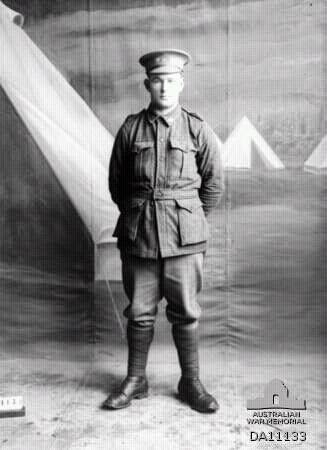 Private (Pte) Olaf Milford Johanson, 11th Reinforcements, 12th Battalion, AIF. I was the first family member to visit his grave in the Somme region of France, a very moving moment for myself and my entire family. Since I have begun researching I have also managed to find living relatives in Sweden, have visited the home built by my Swedish ancestor and have gotten in touch with distant relatives back in Australia, as well as in the United States and Scotland. I have helped friends get started with genealogy, coaching them on the best research methods, basic tips and do’s and don’ts. Helping other people discover information about their families is what drives me to continue my own research, and is what makes me want to share this passion with others. Following my degree completion I moved into working in the computer game industry, and managed to create a successful career for myself. In recent years, however, I have been wanting a change and after much reflection (and encouragement from those close to me), have decided I wish to make my lifelong passion a professional reality. Author Erin TilleyPosted on 25 March, 2015 1 October, 2018 Categories Australia, France, genealogy, Sweden, university, WWI4 Comments on Genea-what-ogy? Erin Tilley is a professional genealogist based in the South East of England. Originally from Australia, she lived for 20 years in France where she worked in the computer game industry, before deciding to follow her passion and change careers completely. She holds a Masters in Genealogical, Palaeographic and Heraldic Studies and researched female title inheritance in England and Scotland.